Who needs bacon when you’ve got soujok? It all started when I wanted eggs for breakfast. It’s usually eggs and bacon, Right? I found a recipe that also calls for rocket leaves pesto. I had neither. I had to improvise and substitute with what I have within reach. I had soujok in the freezer and i had a bunch of fresh thyme. Et voilà! Both soujok and thyme have a strong flavor, but that of the thyme got a little tamed by the olive oil and walnut. 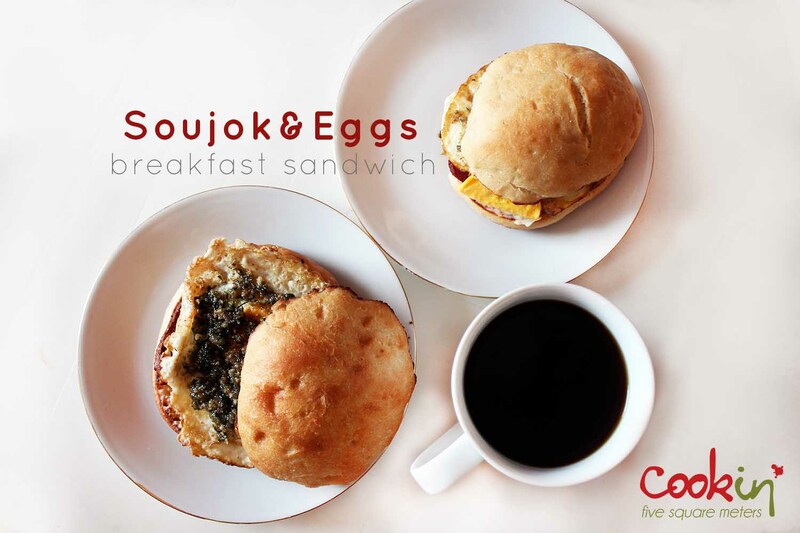 The cheese added a sweet creamy texture to the rigid crispy soujok and crunchy edges of the fried egg. 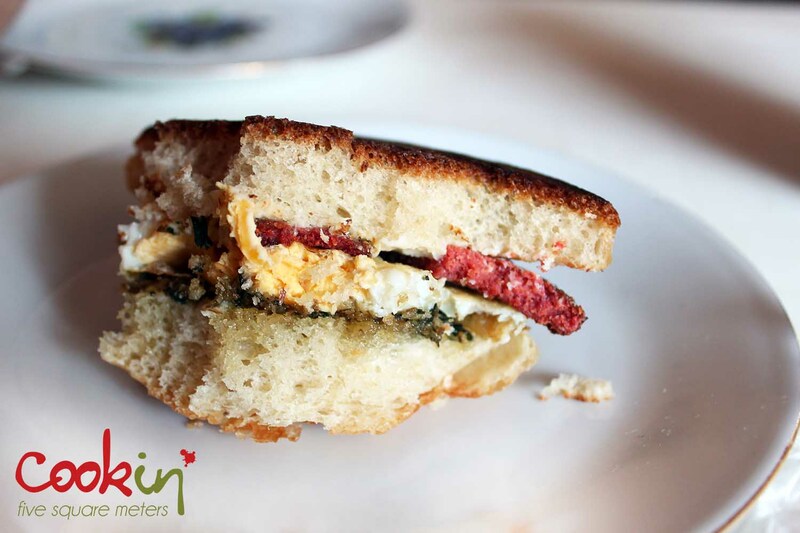 The fusion of those ingredients made the sandwich a celebration of savory flavors that you won’t mind having in the morning. I used the buns I baked for my mouthwatering burgers the other day. It was one of those little perfect things you come up with and enjoy. What could be a better start of a day than this and a hot cup of coffee? Fry in a pan until browned. Set aside on a kitchen towel to absorb the extra fat. Crack the eggs on top of the soujok fat left in the pan (one at a time if you like) making sure they remains as round as the buns and fry as desired. Flip the egg and brown the top side as well. Skip if you like the yolk to be running. In the meantime, slice open the buns and toast the inside in a pan. Make this sandwich tomorrow morning. Try it and let me know: Bacon or soujok? 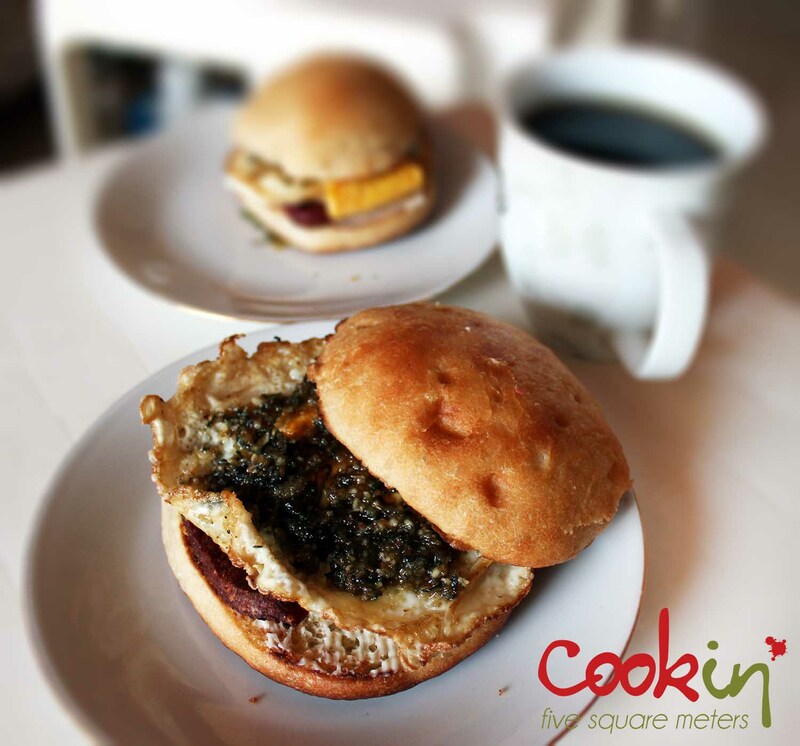 This entry was posted in Breakfast, Sandwich and tagged Bacon, breakfast, breakfast burger, coffee, Cook, egg, Flip, Fried egg, Home, Olive oil, pesto, soujok, thyme. Bookmark the permalink. A friend of mine just recommended checking out your blog, and I am so glad he did! Now I am sitting in front of the computer day-dreaming about a similar breakfast! Yum! love your blog, writing and photography.